I love those little squares, thank you again Heather! My sewing space looks better already, the zips have their own home! - I've cut out for my next rose and star block, if you haven't already you definitely should come and join the party! points if you can spot my teeny tattoo! - Also managed to make a block for the Charming Rainbow Stars quilt after doing some cutting. These are charms from a swap, some are fugly but it's going to be ugly cool!! I'm following basing it on this pattern - I realised that the charms for that particular swap were 4" square not 5". DUH!! So it's a little off! I'd already cut the smaller squares for the points and can't do maths anyway so I just went with it. I still think it looks like a star so that's good!! I was a little disappointed to find that some of the charms still had edges on :( Good job I hadn't planned to use them all or there would have been little holes everywhere! Did you see the exciting win?! I didn't until some of you pointed it out to me (that's what sewing and no blog reading does!!). I was so thrilled to see I'd won Maureen's giveaway over at Maureen Cracknell Handmade. A wonderful Just Wing It layer cake :) generously offered by her sponsor Angie at The Little Fabric Shop. I love this fabric and had seen some lovely projects made with it, I also have two pregnant friends so I'm hoping one will be a girl!! I love Lynne's patterns and I think this will look gorgeous in Just Wing It :) Is it crazy that I've planned what to do when I don't even own it yet!!! Sorry that has been a long post already... hope you'll stay for Part 2 below! Not sure how that's happened with all the birthday cake last week but it must be the boogying! I'd also just like to add how amazing she looks, what a healthy and beautiful body she has! Going to go and do a Cindy Crawford workout DVD later just to top things off! Oh my goodness, you are a quilting/sewing/dancing machine! Great job this week! Well done on your weight loss and your win - looking forward to seeing that quilt in Just Wing it. oh I adore your patchwork zippy - SO darn cute!!! And I'm really a fan of your machine cover & travel sewing kits....like them alot! Fantastic progress! Love those little sewing cases! your WIP are gorgeous Lucy! The paper pieced star looks amazing, so techno color! Have a great week! Mary made me laugh - funny woman! 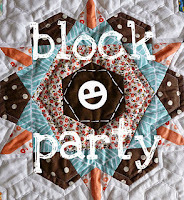 Sounds like it is congrats all round Lucy - are you making a quilt from rose star blocks!? So looking good ....and your pouch is too! And if you were dancing like Beyonce we'd all like to watch that video! Oh yay! I'm liking your rose star block so much better than the one I've basted so far. That ikat print is cool. I think I'm going to baste more and then swap the pieces all around before committing and assembling the blocks ;-) I'm chicken. Yay you! Great job on the projects and on the 3 lbs! Great projects on the go, a win and more fabulous weight loss. You are on top of the world! Just plain to exhausted from reading all that - must be about 200calories right!? Wow! You've had an amazing week. I love that little pouch you made. Way to go with the weigh-in Lucy and congrats on the win.. that is a really cool pattern! You've also made some really cute things with that new machine whirring away! Great job with the weight loss! Love the dancing - I'm going to have to try that for sure. wonderful projects, love how your sewing machine cover turned out. Congratulations on the loss, you're doing really well! And congratulations on the win, I can't wait to see your version of hexagon park! Disappointed that someone left the selvedge on their charm squares, that's just plain cheeky! WOW! I just love your little zip pouches! I wish I weren't so afraid of zippers. How gorgeous are those finished projects Lucy??????? Loving your fabric combos! You are on fire girlfriend! I have no idea what you mean by paper piecing---maybe I will learn about that along the way. I have so much to learn. That block looks very cool.